These eight lovely children’s audiobooks will have young imaginations working overtime! 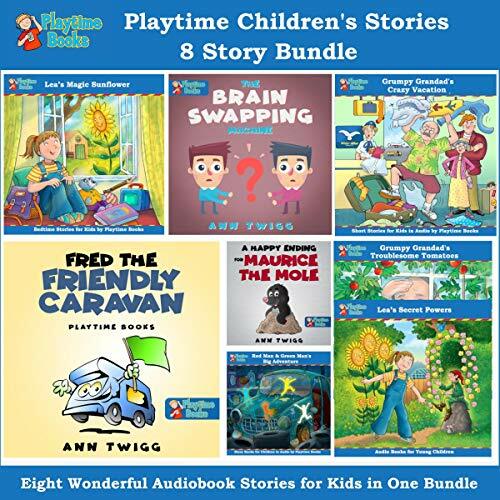 With this children’s storybook bundle you get more value, more listening pleasure, more enjoyment, and more of everything you and your child is likely to want. "Lea’s Magic Sunflower" - Lea never imagined that a sunflower seed given to her by her teacher would lead to magical powers and an adventure she would ever forget. "Lea’s Secret Powers" - As Lea squeezes the magic sunflower petals, a glowing tunnel appears, leading her to an enchanting world of pixies, tooth fairies and magical powers. "Red Man and Green Man’s Big Adventure" - Red Man and Green Man decide to climb out of their traffic lights and explore the human world around them, but they could never imagine the fantastic adventure they are about to have. "Grumpy Grandad’s Troublesome Tomatoes" - Just when Grumpy Grandad thinks that his garden is safe, he discovers that Maurice the Mole has been eating his delicious tomatoes which makes him angry. He needs to catch the pesky mole quick. The only problem is Maurice has eaten too much. What will he do now? "Grumpy Grandad’s Crazy Vacation" - Crazy Grandma is looking forward to a relaxing holiday, but Grumpy Grandad's grumbling is about to cause chaos at the airport. This holiday is one that crazy grandma will never forget. "The Brain Swapping Machine" - Ellis and Archie are asked to make an invention for school, but they want theirs to be bigger, better, and more exciting than anyone else's....Surely their Brain Swapping Machine won't actually work....will it? "Fred the Friendly Caravan" - Fred the Red Caravan is feeling lonely after his best friend Lulu gets a new home, but then a new, bigger caravan called Dotty the Spotty Caravan arrives and a whole new adventure begins. "A Happy Ending for Maurice the Mole" - Things don't go quite to plan for Grumpy Grandad when he finally gets rid of Maurice the Mole from his garden, he actually misses the naughty mole, but will he be able to find him before it's too late? My 6-year-old thinks they're brill! Great stories highly recommended. Warmly read at a patient pace that children can follow. Mine often listens to audio books over and over again so a lot of value here.